Cattle are grainfed to achieve the best quality objectives that satisfy consumer preferences. Paramount to eating pleasure is tenderness and taste as well as the degree to which they are met consistently. SA Grainfed Beef is lean, young, tender beef that has been specially selected from animals tendered and fed only the most nutritious grain products for a specified period. SA Grainfed Beef carcases are specifically selected at abattoirs practicing consistent quality and health standards. SA Grainfed Beef is not trimmed lean and healthy, it is fed lean and healthy ensuring your ultimate eating pleasure. The SA Feedlot industry started during the 1960’s by a few entrepreneur cattle farmers in the grain producing areas that were forced by a lack of grazing to “over winter” their stock on grain and/or potato by products and hay of inferior quality. The facilities, procedures and feeding methods were initially primitive and unreliable. Production performances were unsatisfactory and as time progressed antiquated US technologies were applied and improved upon. International professional consultants in the field of nutrition and animal heath later contributed to industry progress while milling, feeding and construction technologies were similarly imported. The Feedlots were all owner financed and cattle were either self owned, self bred or self purchased. These operators started experiencing common problems from the statutory bodies and opposition from primary producers and bureaucratic structures that considered them competition. These operators got together and on common ground established the SA Feedlot Association in the early 1970’s. The SA Feedlot Association has gone through the same growth pains as the Industry. Initially a function allocated to someone as an extra job but of minor importance. Later allocated a function of the SAAU using their secretariat and offices for meetings. This was replaced with a part time official and now a member funded self standing organisation representing 96 % of all cattle on feed with two full time Association employed staff and own offices in Pretoria, South Africa. 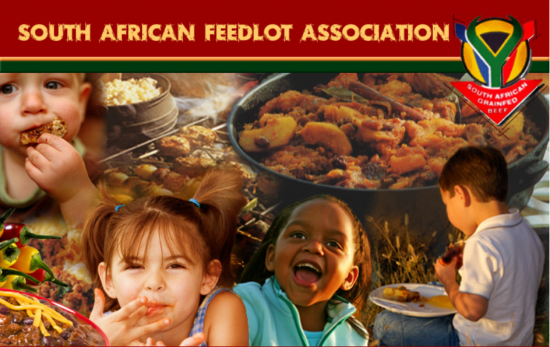 Today the SA Feedlot industry is a flourishing industry that produces approximately 75 % of all beef produced in South Africa which in real terms is in the region of 1,35 million head per annum with a one time standing total of + 420 000 head. Following the recent deregulation of the SA Meat Industry a number of the larger feedlots have progressed vertically into not only the slaughtering of their own cattle but into the wholesaling and even retailing of their own branded quality beef products. What is SA GRAINFED BEEF? The SA GRAINFED BEEF trademark is registered for the sole use of the members of the SA Feedlot Association in South Africa and its neighbouring countries. The higher growth rate of carcase animals results in a much more tender meat than that of animals which follow a grass-fed diet pattern. The reason being that meat tissue known to cause toughness is reduced in animals with a faster gain. This was one of the facts to emerge from the National Beef Tenderness Conference held in Denver, USA in 1992. SA GRAINFED BEEF originates from specially selected animals fed only a nutritious diet of the highest quality grain products for a specific period. The carcases are specifically selected according to strict criteria before qualifying for the SA Grainfed mark. These criteria include the age of the animals,as well as the time they are cared for and other criteria which could have a negative impact on the consistency of meat quality and safety. SA GRAINFED BEEF is lean, tender young beef selected according to the strictest A Grade age specifications with a specified fat coverage over the whole carcase to ensure the ultimate eating experience. Technically speaking, this means that animals are selected for their lean meat attributes from beef breeds known to produce tender beef. Management practises are in line with guidelines to ensure no undue stress or excitement known to impact eating quality. SA GRAINFED BEEF originates from abattoirs maintaining high standards of hygiene and classification. The trademark aims to distinguish South African Grainfed beef of consistently high quality from ordinary grass-fed beef and imported beef of dubious origin and quality. Americans consume beef with an average fat content of 30 – 35%. In South Africa, there is as little as 13% fat. Marbling in US beef could reach 10%. SA Grainfed Beef has just over 1%. This means there is no fat to trim. The animals are fed specifically to provide lean meat.